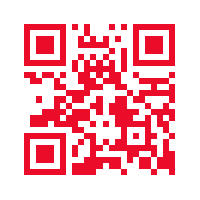 Check them out, they are terrific. 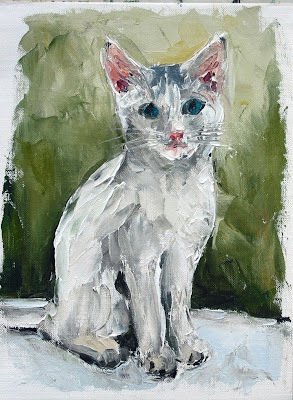 I painted this cat in the last few minutes of class a few weeks ago really trying to keep the colors warm. I till see some cool colors still trying to creep in, but I think I did a better job capturing the original. 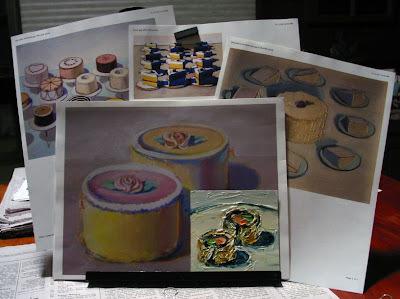 You can see our painting class in action by visiting Kim Morin Weineck's blog post here. I just finished a painting that Denise commissioned me to do for her sister's upcoming birthday on April 1. 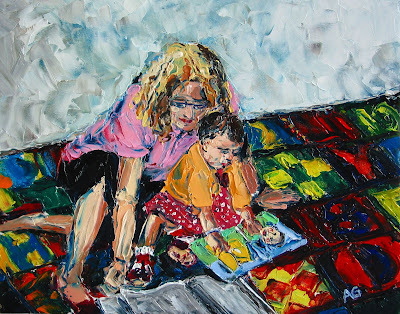 She told me that she had seen some paintings I have displaying at Gallery 9 that are based on old family photos and she thought it would make a nice gift for her sister who "has everything". She brought me several fun family photos to choose from and we finally selected this one. It is the cutest thing, right? Don't we all have photos like this? 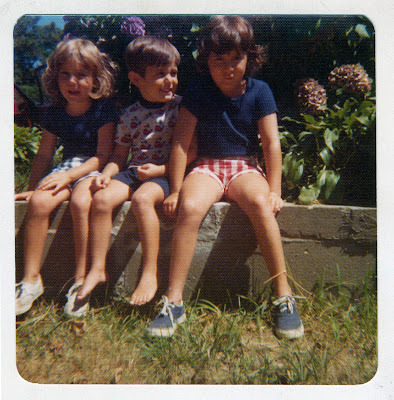 That's her sister Beth on the far left, brother Billy in the middle, and Denise on the right. I think it's fun to see paintings in progress so I took this photo at an intermediate stage. I started in on the faces first, which is usually the hardest part. Then, the background of this photo was really fun with all of the foliage and the hydrangeas. 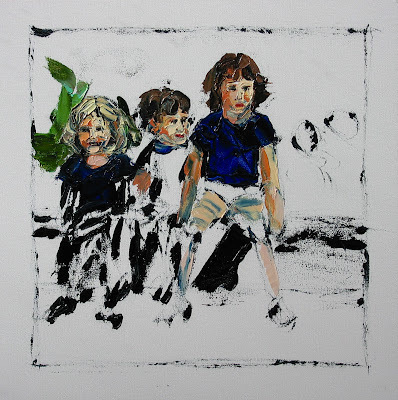 Beth lives in Miami so I hope this painting will be a nice reminder of their family days spent on Cape Cod. Happy Birthday Beth! 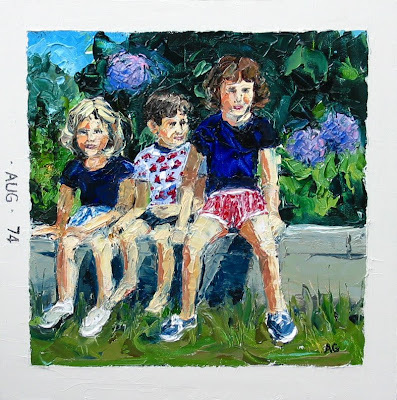 Check out my other paintings done from old photos in the Family Album series. Last night, I gave the latest Different Strokes for Different Folks challenge a whirl. Here is the photo Karin Jurick posted. I think food is difficult to photograph and to paint. I mulled over how to tackle this piece for the entire 2 weeks. 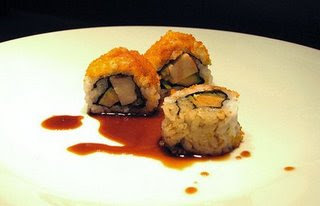 I even went to my favorite sushi place, Snappy Sushi on Newbury Street, for lunch one day to get inspired. 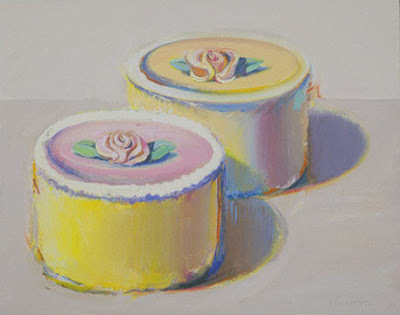 Then, one of my favorite artists suddenly came to mind, Wayne Thiebaud. 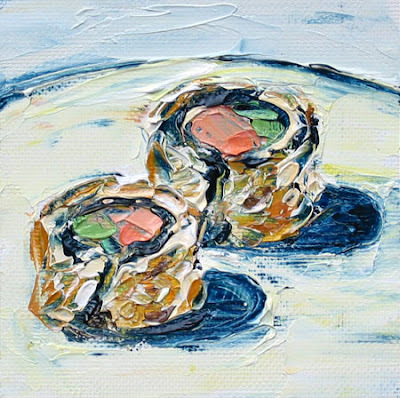 I love the way he so deliciously depicts food in his work and so my version of sushi was inspired by his wonderful paintings of cakes and pies. 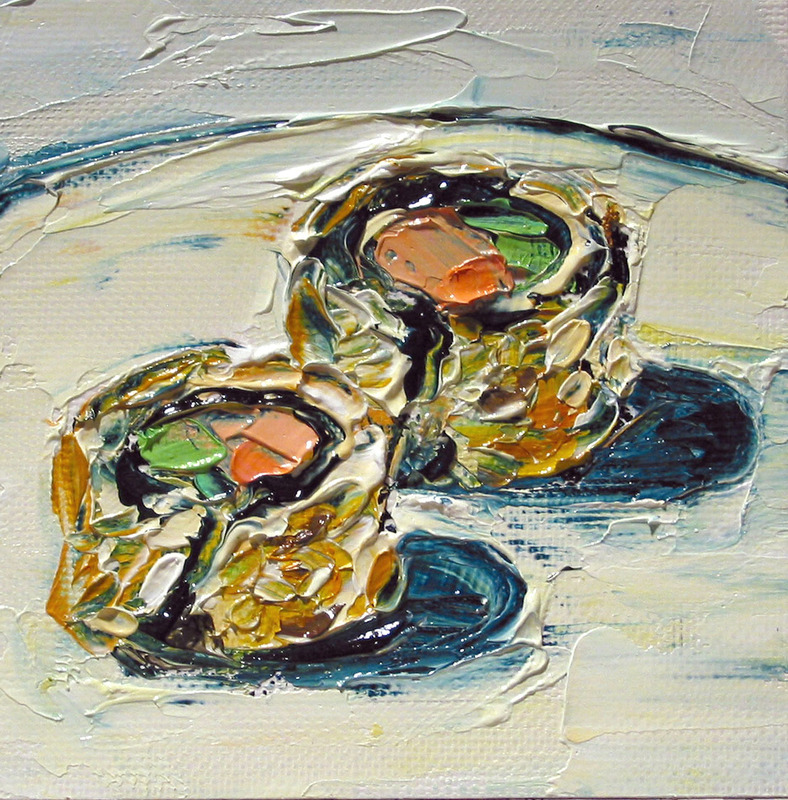 In particular, I envisioned how the composition of this painting could work with sushi. This is only about 3.5" by 3.5" but I really laid on the paint, didn't I? It was kind of like icing a cake. And finally, here is a photo of the Theibaud inspirations I had on hand as I worked. Here is a redo of my photograph which had some glare spots on it. The color of this image is probably closer to my original and more Thiebaudlike. 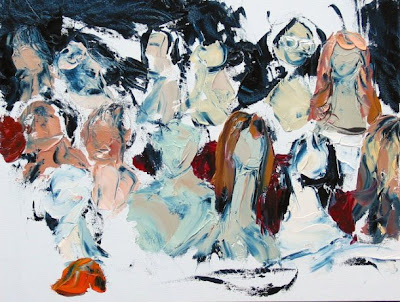 I find getting a good image of your painting is one of the biggest challenges in art. Any suggestions from others are welcome. Ok-now I am obsessing. I think this photo looks too blown out now. My painting is really somewhere in between the one above and this one. Maybe I need a new camera. The one I have is a Canon but several years old and only 4 mega pixels. Anyone use a camera to take photos of their art that they really like ? 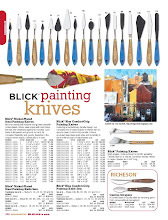 Today is my art instructor and friend, Kim Morin Weineck's, birthday. I just dropped off this painting I did for her from a photo I took awhile back. This is Kim and Lucy reading. So Tim doesn't feel left out, I decided to paint him into Lucy's book. I think perhaps I may have to edit this now so that Kim is reading from her new Kindle 2 instead! 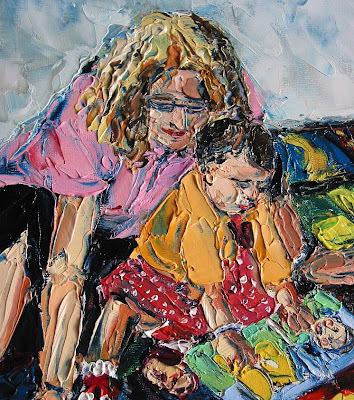 The artist Karin Jurick hosts a blog called Different Strokes From Different Folks and every two weeks she posts a photo inviting artists to do their own interpretation of the image. She then posts all of the entries on her blog. Fun idea, huh? If you click on the link to her blog, you can see the entries for all of her past challenges in the side column under View The Collections Together. She has gotten up to a hundred entries and I think its' really interesting to see the different styles and interpretations. I decided to give it a try this weekend. Ok- so here is the photo she has posted for the current challenge. I was excited about the palette knife possibilities of all of the different textures here. 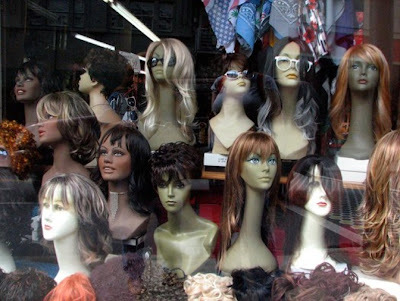 Isn't it interesting how even though they are just mannequins heads, they each still have a distinct personality defined by the wig they are wearing? Here are a few stages of my painting. The third one is the final piece I sent to Karin. Here is a close up . I thought this was an interesting angled view where you can see size and the texture of the painting. I changed the hairstyle on one of the mannequins in the photo. Did you spot it right away? It's snowing like crazy again this morning. Aaaaahhhhhhhh! 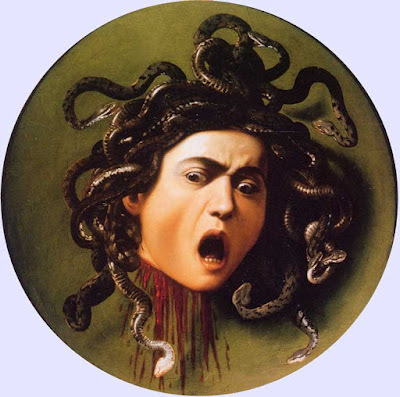 Yesterday we attended a lecture at RISD (Rhone Island School of Design) about the artist Caravaggio. I knew very little about the artist before yesterday, but what a troubled and violent life he led. His mother died when he was a young boy and shortly after, his father, grandfather, and uncle all died of the plague leaving him an orphan. 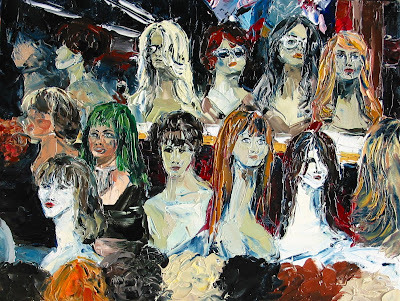 He painted during most of his turmultuous life with mixed reactions. About half of his commissions for the church were rejected. He continually ridiculed other artists of the time, was constantly getting into fights, and was on the run for murdering a man. 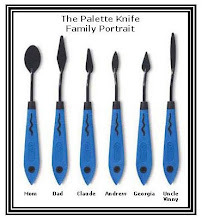 But even on the run, he continued to paint. He sent this painting to the Knights of Malta who were hunting him down for the murder. 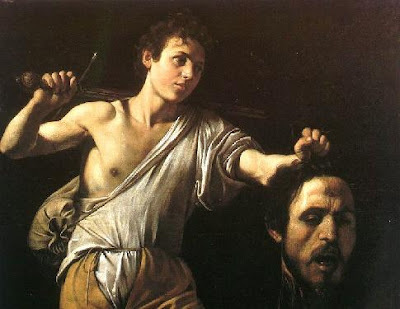 The head of Goliath is is a self portrait and was sent to taunt them. No matter the violence, his mastery of the craft and the dramatic effects he used are admirable. 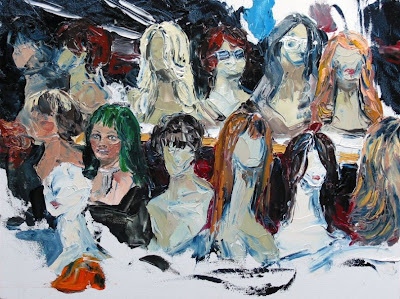 Some people at the lecture (many non artists) were bothered by some of his anatomy renderings-"it doesn't look right" and by the fact that some of the male figures look very feminine "why does he have a ribbon in his hair?" But it is undeniable that his style of "in the moment" was striking, upfront, and immediate. You have to take note. He makes you feel like you are right there watching. 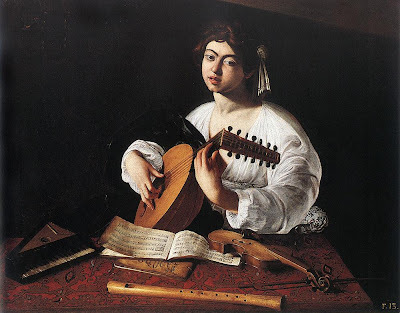 It's also interesting that the music in this painting is real and the notes could actually be played if you had a really good hi res image. We were discussing afterwards that we thought his life would make a great movie. Then today I discovered that there is a movie that was made in 1986. We going to try to find it somewhere and watch it. But perhaps it's time for a remake-could be a Joaquin Phoenix comback! There are two more classes in this series. Rembrandt and Vermeer. I can't wait!